You knew this had to be coming, right? 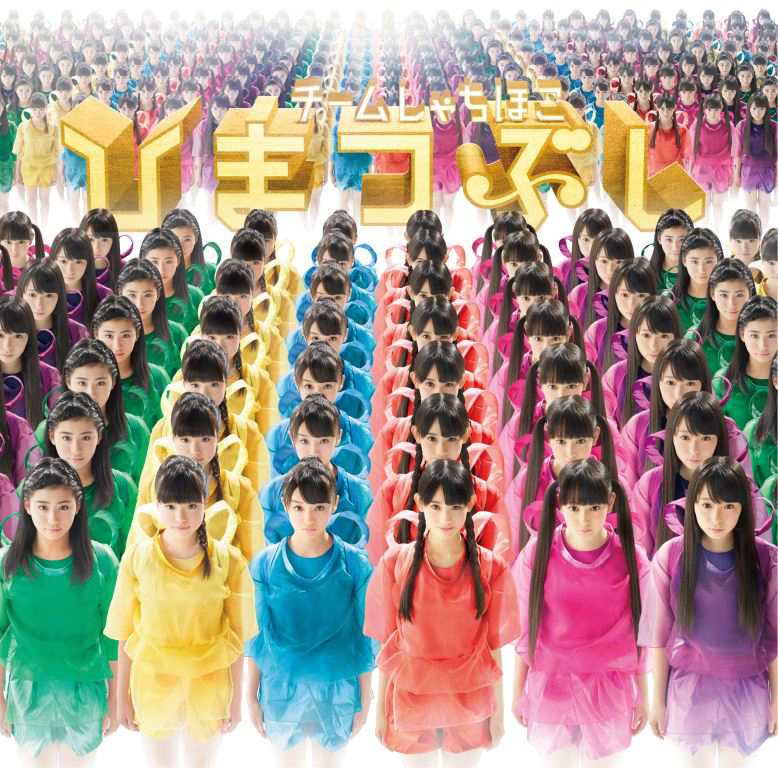 Team Syachihoko put out two EPs this fall – Ii Janai Ka and Ee Janai Ka, which each had five new songs. 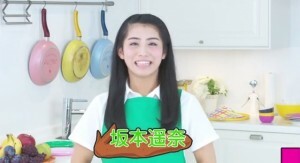 The first one, Ii Janai Ka, was almost entirely written by Team Syachihoko’s normal songwriter (except for the cover song, JOINT). Ee Janai Ka, on the other hand, features collaborations with other artists and songwriters. As someone who enjoys both Syachi’s standard songwriting and the work they’ve done with other artists, all of this has been pretty exciting. So, what do I think of Ii Janai Ka? 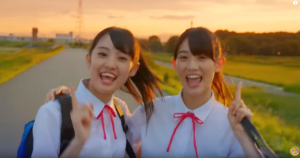 For being a Syachihoko song this is a fairly normal sounding one – it’s an upbeat, easily understood guitar-heavy rock song. It’s not doing anything terribly unusual and there isn’t really a trace of the weirdness that usually indicates Syachi songs. 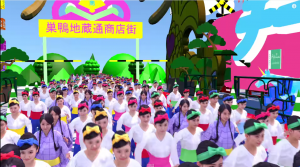 Now, that’s not necessarily a bad thing – Shampoo Hat is fairly “normal” and it’s one of Team Syachihoko’s best songs and my personal favorite song of 2014. 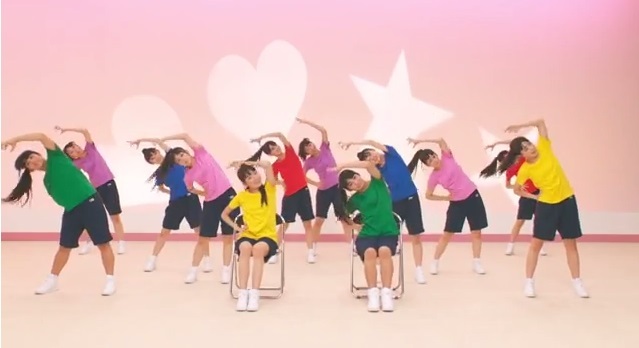 However, it works because it’s an extraordinarily good “normal” song. Basyauma Rock isn’t a bad song by any means, but it’s just pretty average. It isn’t weird and it isn’t good in the way Shampoo Hat is good. That said, Basyauma Rock has a lot of strengths. For one, all the members do a really great job of it. Nao’s vocals in particular have improved and sound great in Basyauma, but both of these EPs do a lot to show just how much Syachi’s members have become better performers. 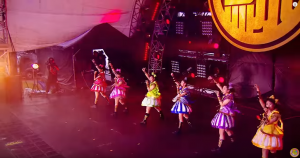 The section midway through the song, “atama sagete kao wo agete” where all the members gradually join in is very nice, too, and the highlight. 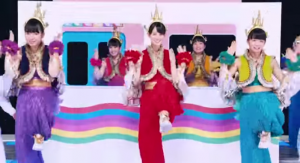 So, hot off the heels of calling the track a tad disappointing comes me saying that this is one of the best shot idol PVs I’ve seen in a while. It’s not particularly unusual stuff, but man is it beautifully made. The framing is just about perfect, done very artfully. 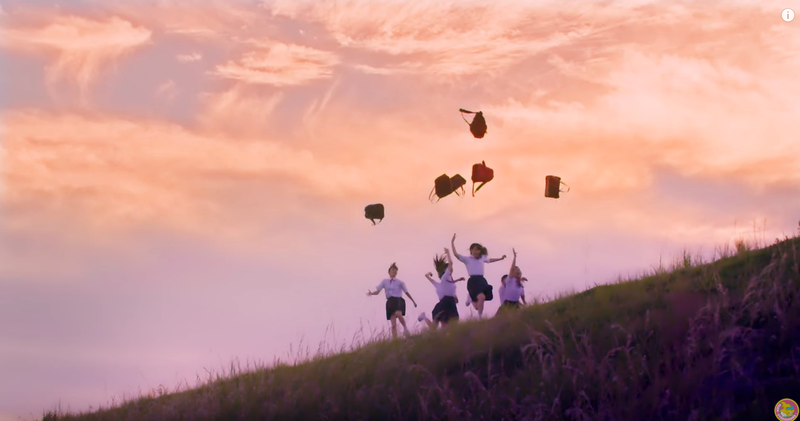 Every single frame looks gorgeous, and the cinematographer did a great job of setting it up so no shot looks boring. The camera is often moving and fluid, especially in the dance shots and closeups, which allows for a lot more dynamic shots. However, the thing I was most impressed with when it comes to the framing is how well it works with the Rule of Thirds. Basically this is a design guideline that asserts that when thinking of a frame you should think of dividing it in nine equal parts, and have important subjects along those lines. So rather than having a subject be centered, that thinking of a frame in thirds/nine parts allows for more dynamic images. And while this is hard to do exactly while filming things (especially if you’re filming moving subjects), quite a bit of Basyauma Rock is filmed along those lines, creating some very visually stunning shots. The lighting and color balance are also spectacular – colors pop earlier in the PV, and things become a bit more muted later on in the PV, but it works because the earlier half is supposed to take place in the morning/early afternoon and the second half is more of the late afternoon/evening. Everything is lit artfully and looks wonderful. Another filming technique is the lighting “magic hour” – this is a short period during sunrise/sunset where everything is still lit but it’s a much redder light. It’s considered a very aesthetically pleasing light, and it’s not around for long so it’s trickier to shoot with. And oh look, Basyauma Rock uses it to great effect. 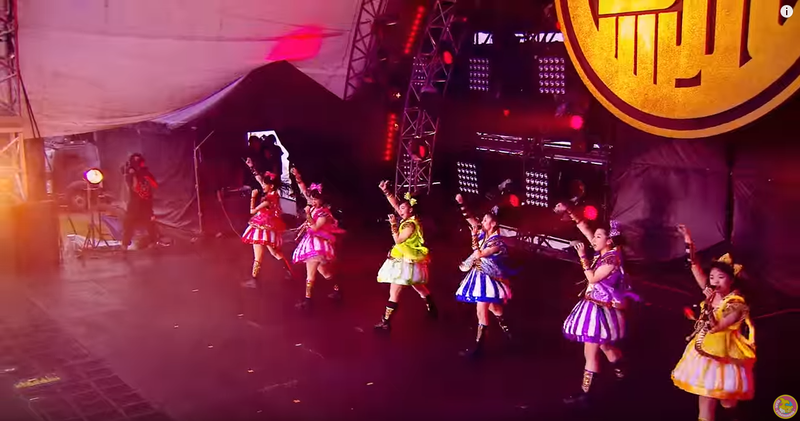 I also like that the lighting at the Syachi Summer concert also is reddish gold – it matches really well, and this connects the concert sections to the rest of the PV aesthetically. Joint is a cover of the song by RIP SLYME – however, it works so well for Syachi that I would have not guessed that to be the case had I not known. 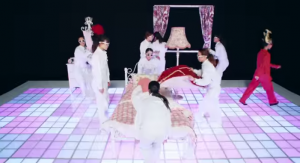 The song is mostly rap with a sung chorus that works very well. Before this song Haruna had been mostly in charge of the few rap sections that Syachi has had in the past, however every single member works well in this song and has pretty solid flow. 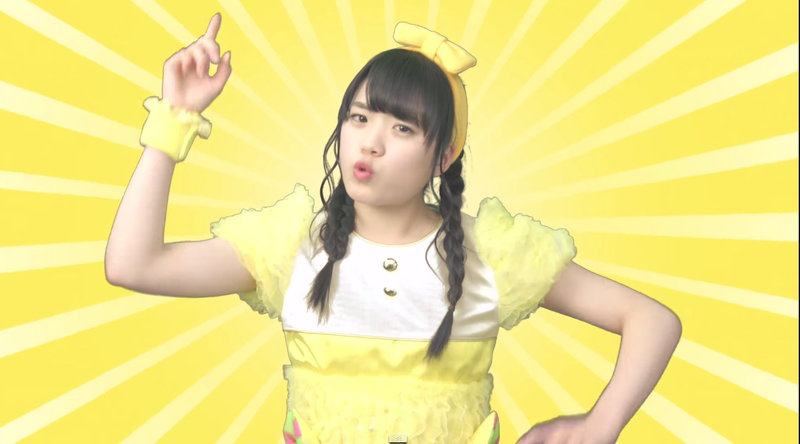 Haruna is the clear forerunner for rap ability, but Ando Yuzu’s verse is very good, too. It’s enough to make me wish that Syachi had more rap songs in their repertoire. This song is fantastic and weird. 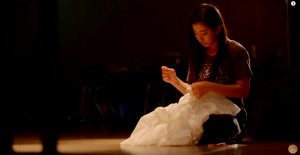 And very addicting – I just had to stop reviewing this because I was getting too into the song. It’s a very disco inspired song, which you know I like, but in addition there’s a big electronic feel to it. It’s almost hard to review this because, as normal Basyauma Rock is, that’s how unusual Nigi2Wonderland is. Which is excellent, as far as I’m concerned. This is a really fun, funky track that is easy to listen to in its strangeness. It builds up nicely throughout the entire song and has a great pacing to it. It’s an effective electronic dance song. The entire group does a great job performing in it, but the real star is Honoka who repeats “nigi nigi nigi nigi” over and over at certain parts in the song and gets the rap section, which is unusual (usually Haruna gets this) but it works so well here. Immediately the first thing you notice in this song is the heavy use of piano, which carries throughout the song, and adds a lot of character to this. The entire arrangement sounds great – Chighuhagu sounds beautiful. This song has a lot of intensity to it – the piano/strings of the arrangement serve as punctuation between sections of the verses, and there is a lot going on between the vocals, the melody and the contrasting piano/instruments. However, what adds a lot of the intensity are the vocal performances. Syachi proves again that they’re improving vastly vocally. Nao’s solo near the end of the piece is just fantastic. OK, ballads don’t do much for me. We all know this. 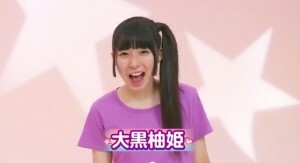 However, as a ballad, Yume no Tochuu does a lot to make me like it. The melody is cute and pleasant to listen to. The arrangement is fantastic as well, constantly moving behind the melody – this adds a lot of vocal interest. There are some interesting sounds to Yume no Tochuu as well – the song starts off with what sounds a bit like a harpsichord, and there is an organ sound to the piece as well. Overall: While I don’t know if any of these songs would be one of my favorite Team Syachihoko songs, that is a very high bar. 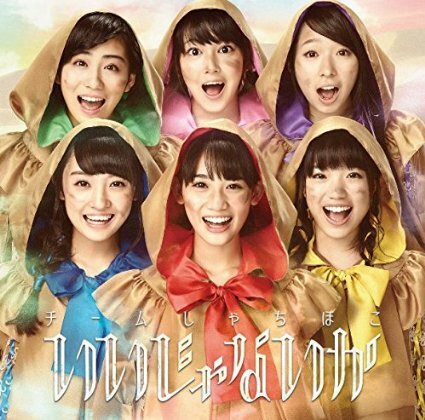 Instead, Ii Janai ka is a very solid EP that shows the growth of Team Syachihoko, in both the production of the songs as well as the vocal performance of the members. It is a very good effort, and one that you absolutely should check out. You didn’t think I wouldn’t review this, did you? 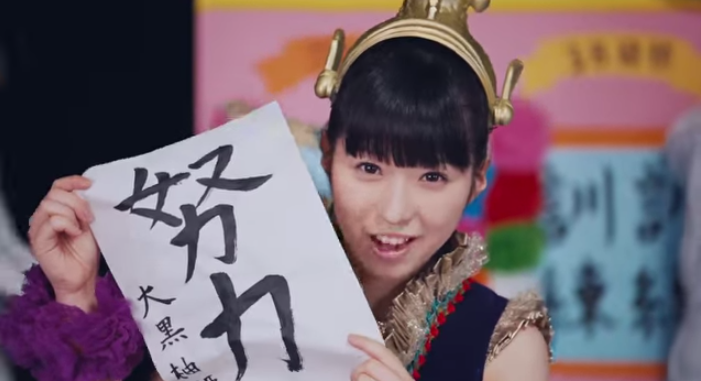 Song: This song is the spiritual successor of Shuto Iten Keikaku, in a good way. 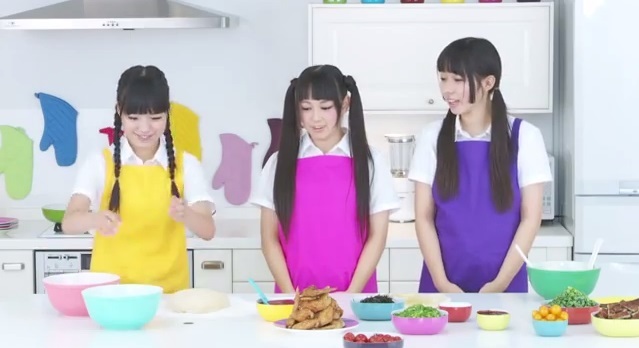 Doing a six and a half minute techno track is not what I thought Team Syachihoko would be doing when I first got into them, but this type of thing fits surprisingly well. I’m not a techno expert, so I can’t attest to how good or genuine this is on that vein. However, the songwriter is Yoshida Tetsuto, a Japanese techno artist who has done a few things with idol acts like Negicco, but not quite to the level of writing Ii Kurashi. 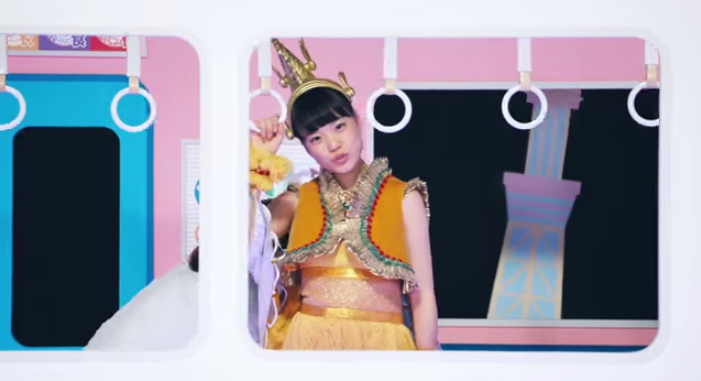 However, as someone who has more experience with techno than pop, Ii Kurashi is yet another very appealing song by Team Syachihoko. Ii Kurashi is a song that will grow on you. It’s the ultimate earworm; the first listen or two might not grab you, but the song will eventually grab hold and not let go. The thing I find remarkable about Ii Kurashi is that, for being six and a half minutes, it never outstays its welcome. One of my biggest complaints for a lot of idol music is when it drags out too long; there’s no need to overextend a pop song. Ii Kurashi is long, but it works while being long. Everything feels like a perfect length and, when I first heard the song, I almost couldn’t believe that it went on as long as it does. The arrangement works very well, even though I’m not usually partial to completely electronic instrumentation. I think the big difference is that an actual techno artist wrote this song, so the rhythmic techno instrumentation works well. Everything about this song works in a way I never really expected. It’s well-written, well-arranged, and well-performed. Even when the song changes things up (like in the rap section), things just work. 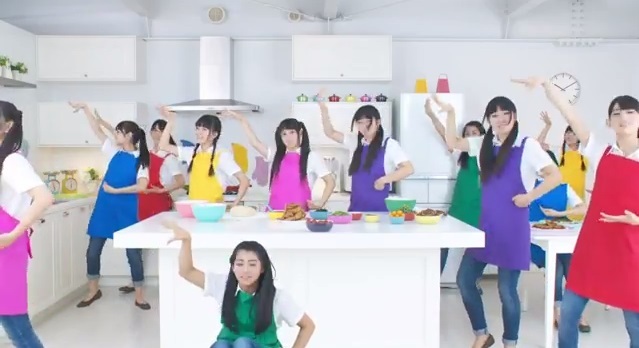 While not being a very typical Team Syachihoko song, the group has taken a techno song and made it their own. I love it. PV This PV again continues what Team Syachihoko started with Shuto Iten Keikaku. In fact, this is driven home by the fact that the PV references Shuto Iten Keikaku at the end of the PV. What I mostly mean by that is how the PV flows; whereas Shuto Iten Keikaku flows smoothly from transition to transition, Ii Kurashi does something similar, only on a smaller scale. While Ii Kurashi does have a fair number of obvious cuts in the editing (in contrast to Shuto’s smooth transitions), the scenes transition from one to another mostly by use of sets moved around by people in white. This gives an intentional low budget feel that works. This makes Ii Kurashi have a distinct, good looking visual style.
. There are occasionally some props used and, near the end, a section that allows the girls to wear different costumes. This is used sparingly, and always for emphasis. This adds a lot of visual intrigue to a relatively simple PV. 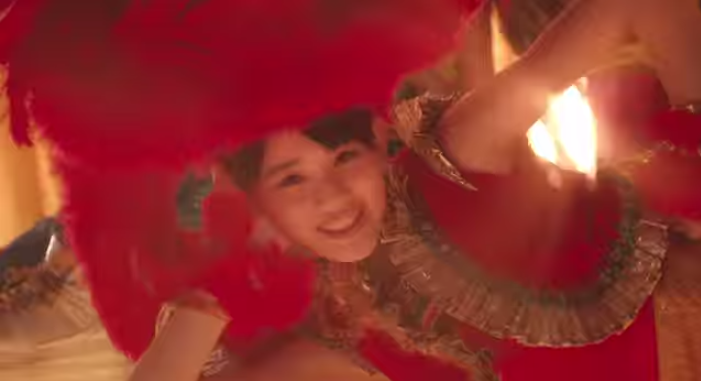 Generally, this is a very well shot PV. The lighting is always fantastic, for example, which certainly helps the PV’s visual style. The only thing that I dislike about this PV is that there are occasionally some shots where the framing is a bit weird. 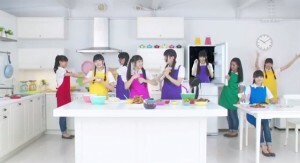 I understand why; they’re trying to do stuff in one shot, they’re zooming out, and as such Nao gets cut off, but it still looks kind of weird to have shots where one of the members is almost (but not entirely) cut out. 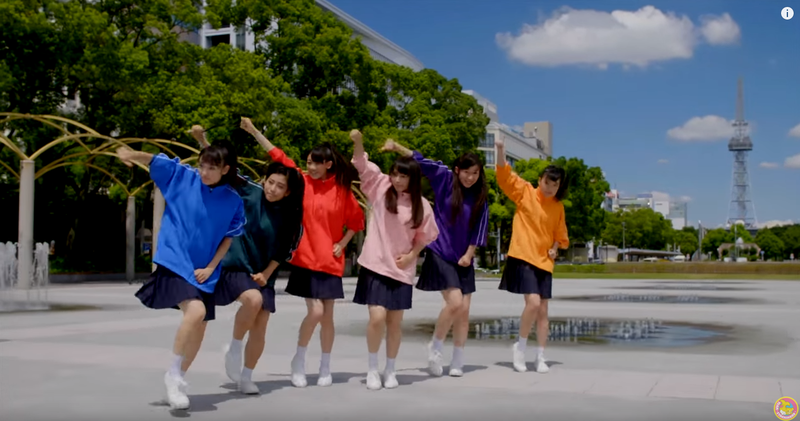 Other than that, Ii Kurashi’s PV is simple but well-produced, with a distinctive visual style that makes it a wonderful PV. This week, I was unsure of what to review. So I asked my Facebook feed what I should do. (By the way, if you want to see me review something, leave a comment). There were a few good recommendations I’ll get to in the coming weeks, but Chiima of Okay! 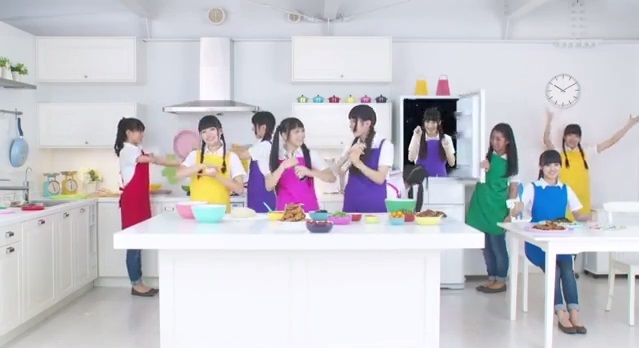 Musume Time asked for Team Syachihoko’s Ai no Chikyuu Sai. 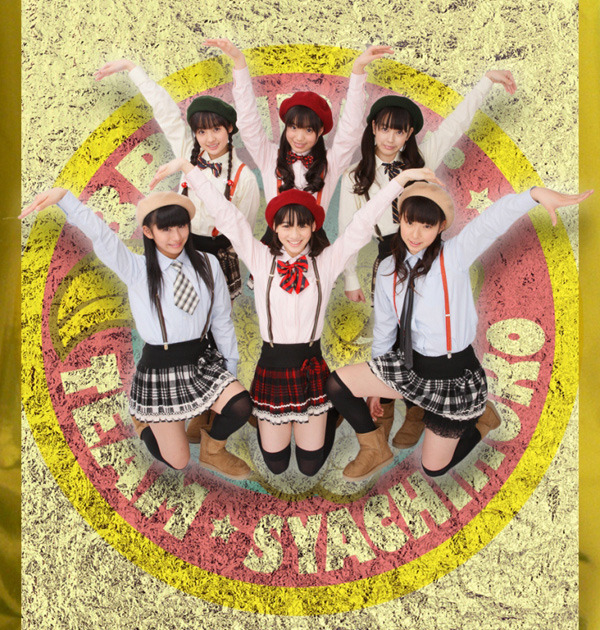 I’m a complete sucker for Team Syachihoko, so Syachi review it is! 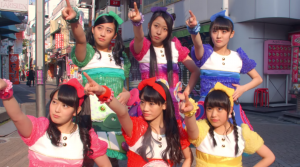 Just a small note that I do adore Team Syachihoko, they’re my favorite idol group, so there is some bias there. Song: This is certainly different. After last single’s loud and bold ‘Shuto Iten Keikaku,’ written by Japanese hip-hop artist SEAMO, in which Team Syachihoko declares their intent to change the Japanese capitol to Nagoya, this is tame and laidback in comparison. I’d imagine for most people it takes a couple of listens to get into this song. At first I didn’t know if I liked it, but after multiple listens/views of the PV, I adore it. The thing is, this is definitely not as impactful as The Stardust Bowling, Koibito wa Sniper or Otome Juken Sensou. This is slower and laidback, even when the song speeds up for the chorus. But, in a way, I’m really happy this is the type of song Team Syachihoko chose to put out so relatively early in their careers. It shows that they aren’t just typecast into high energy songs like the ones I mentioned, but can do these easy-going songs. This doesn’t mean that the song goes along at a snail’s pace; there’s a good tempo for it, and I really like the instrumentation (electronic/dubstep-influenced and all). 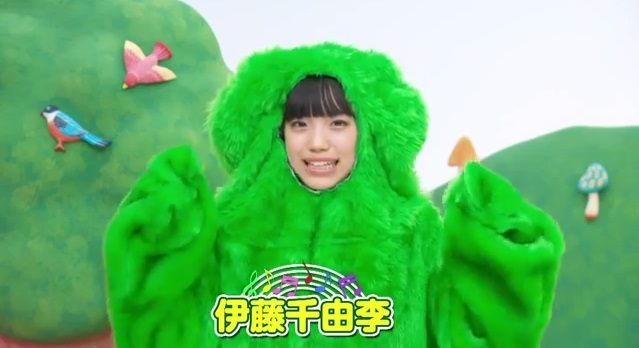 It’s just not quite as energetic as Syachi’s other efforts. One thing I find interesting is that this song was written by some pretty big names in the music industry. The song was written and arranged by Komorita Minoru who, in addition to a solo career, has written for a lot of artists. Notably for me he wrote a few songs for Matsuura Aya later in her career, Happy to Go and Blue Bird (from Double Rainbow, my favorite Hello!Project album ever), and Charisma Kirei for Melon Kinenbi. So, knowing these songs that he’s written, this type of mellow but upbeat song makes sense. 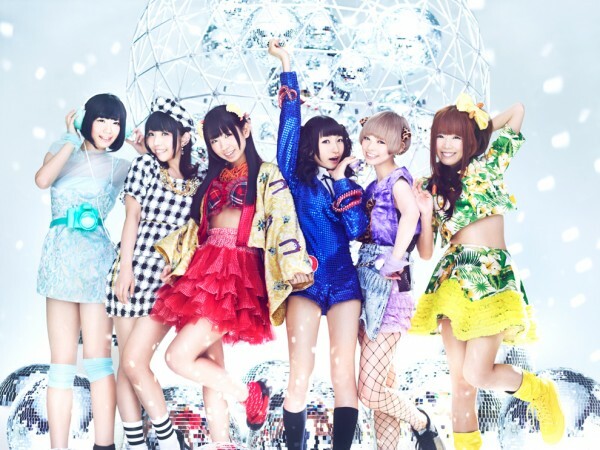 The lyrics were written by Miyashita Kouji, who, amazingly, wrote everything to Maru Maru Mori Mori. Since this was such a huge song, I’m impressed that Syachi got him to write their lyrics. All in all, I can see that people might not get this song. I didn’t get it at first. However, it really grows on you and becomes a song that you like despite not expecting it. I’m guessing the justification is that this is now a Syachihoko centric world, where Syachi is at the base of everything. Which we’ll see later. 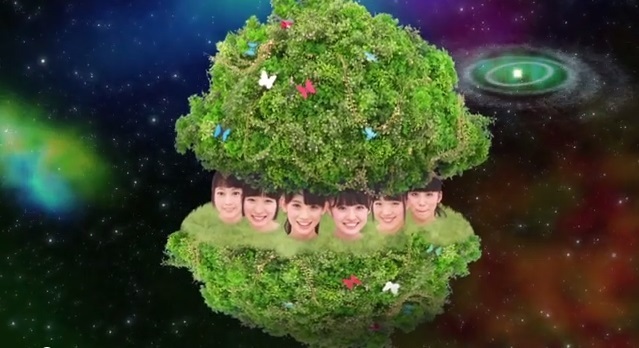 But this image of a tree made of Syachi floating in space is just… strange. 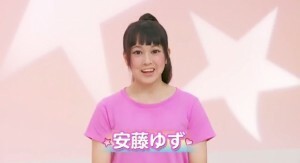 Basically all of Team Syachihoko are appearing on shows basically just featuring them. And a show that’s basically them as frolicking monsters. 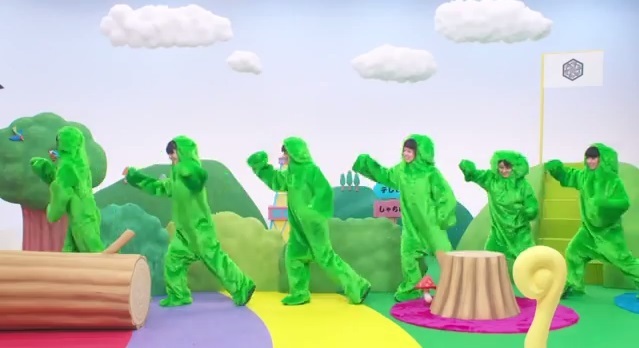 A local concert venue I go to see bands at (mostly indie type bands) shows stuff on screens before the event, sometimes, and one time I went there was a Japanese show like this; basically people in monster suits running around a forest. So even if this seems strange, this does have precedent. As for this so far, I really like it. It’s colorful, fun, but still seems simple. 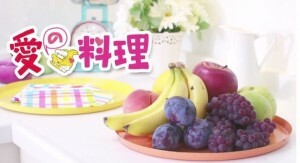 It’s not overbearing in its wackiness, it just seems to be perfectly content with being colorful and fun. However, as soon as you think “oh this is pretty normal, Syachi starts throwing stuff at you. Yep, Yuzuki’s hanging out in a space fridge. 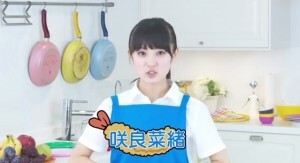 A side note, but I wonder why Stardust groups tend to put my oshimen in the fridge? 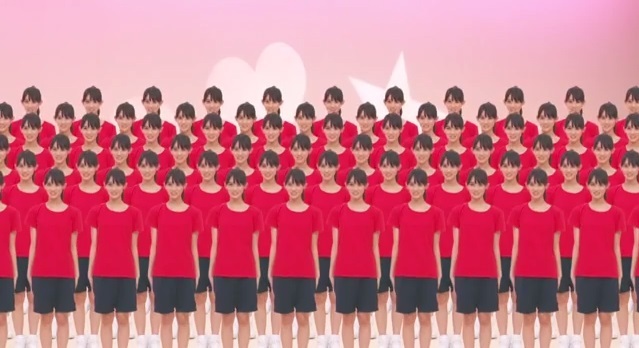 But this is just the start as things get progressively weirder and more and more copies of the Syachi members start appearing and they dance. More copies come in near the end of the song when the song increases pace. And then none of it’s explained, but does it really need to be? If you have an aversion to weird PVs, this is probably not your cup of tea. 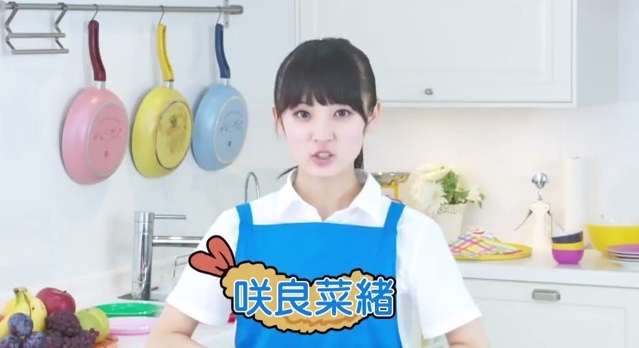 But personally, I really like their take on the various TV genres, and I think it’s another really solid addition to the other two PVs that Syachi has. It may not have the initial weirdness of The Stardust Bowling or the cool factor of Shuto Iten Keikaku, but this is a fine PV and song and I’m one I’m glad Stardust chose to do. 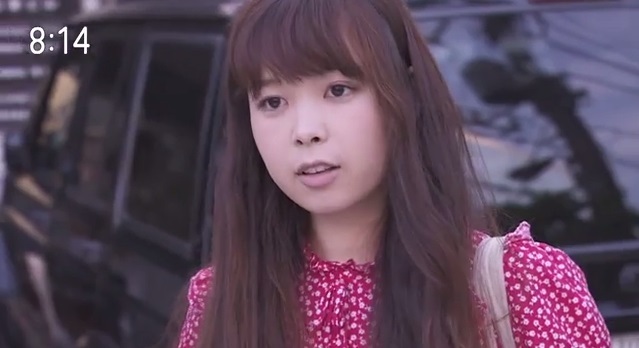 What Makes an Indie Idol Indie? Recently, Ray of Idolminded and now Pure Idol Heart posted THIS on Pure Idol Heart. As a fan of Pure Idol Heart in general (having named it my blog of the year at Idolminded) and as a fan of Ray’s writing (at Intl Wota and now Idolminded) I was really interested to hear what he had to say. All these groups have a lot of enthusiasm, a lot of energy, and a lot of excitement, moreso than some of the major acts I’ve encountered. In my head I refer to all of them as indie idols, even though that’s not exactly the case. As Ray mentioned, things aren’t necessarily very cut and dry. To me, this reminds me a lot about independent films, specifically the current Independent Spirit Awards. As you might imagine, the Independent Spirit Awards is an award that is given out to independent filmmakers. This is something I really appreciate, given the power that the major film studios have. However, last year Silver Linings Playbook got four awards including best film, best leading actress, best director and best screenplay. Now, let me just say that I absolutely adored Silver Linings Playbook; it ended up as one of my favorite films of the year (though Moonrise Kingdom ended up being what I considered to be the best of 2012). However, I would be hard pressed to call it an independent film. It had a budget of over 20 million dollars (which to many films is a very small budget) and was partially produced by and distributed by the Weinstein Company, a major force in awards season films, especially. They distributed The King’s Speech and The Artist, both which won the Academy Award for Best Picture. Again, I liked both of these films as well, but it’s hard to define these as independent films. Likewise, there are many films that come out from major studios that are almost designed to have an indie feel and appeal to the audience that likes that sort of thing. Indie, rather than a category for finances, has become almost an aesthetic and stylistic choice more than anything. I also found what Ray said about pushing boundaries quite interesting. Because out of the six groups I named, the “safest” or most traditional (I’d argue) are MMJ and rev.from DVL, the two indie acts, whereas the major label acts are pretty eccentric. Innovation is happening both in the indies and in the now majors, so it’s exciting stuff. I don’t know if I have much more to add other than agreement; it’s a tough and somewhat nebulous distinction to make, even if it initially seems cut and dry.